Sunday July 11th 1924 The girls and Rob took things to the other house part of the day. I did things for myself and wrote to Lydia and Warner McCall. We rode up to the new house to spend the evening. The Byingtons there too. Saturday July 12th 1924 We took a couple of loads in the big car to the other house and then watched the show parade. The Whetstones went in afternoon. Mormia went home. I busy at home. Hattie and I worked at packing in evening. I wrote to Lizzie Lindley. Monday July 14th 1924 We were up early and the transfer men and the boys with the store truck took things away all day. LeGrand brought the last of mine down here. I ironed a lot of things that Normia had washed and helped in other ways. I came down to Otts about five oclock and the girls were about ready to leave. Good by to the old home. We rode after supper. 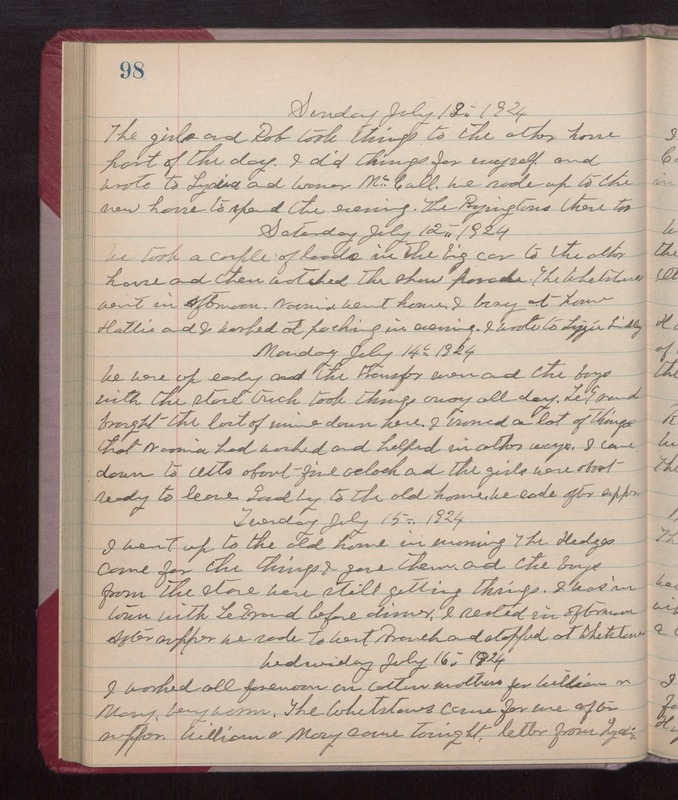 Tuesday July 15 1924 I went up to the old home in morning. The Hedges came for the things I gave them and the boys from the store were still getting things. I was in town with LeGrand before dinner. I rested in afternoon. After supper we rode to West Branch and stopped at Whetstones. Wednesday July 16th 1924 I worked all forenoon on cotton mattress for William & Mary. very warm. The Whetstones came for me after supper. William & Mary came tonight. Letter from Lydia.